The US is the third largest country in the world based on land mass. With a population of around 323 million it is the third most populous country in thr world after China and India. 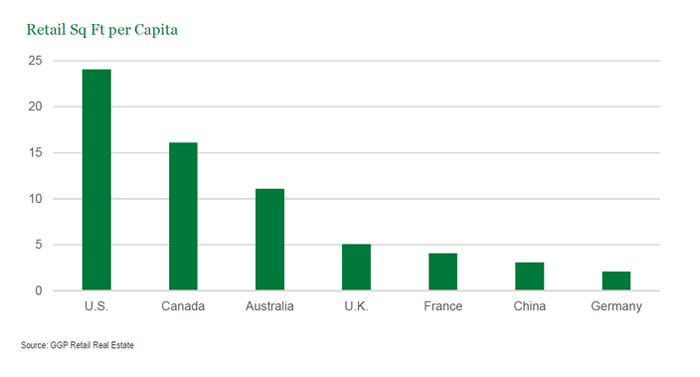 In terms of retail space the US has the highest amount of space per person than other major developed countries. With the explostion of online shopping many national chains are closing stores every year. According to a Credit Suisse report, about 8.640 stores are projected to be closed this year compared to 6.200 at the peak of the Global Financial Crisis(GFC). The difference in retail space per capita between Germany and USA is shocking. Years of overbuilding of stores and shopping malls in the US like there is no tomorrow has lead to the death of many of these cathedrals of capitalism in recent years. Abandoned malls dot the country from small towns to mid and large cities. Over the next decade or so many more thousands of stores and hundreds of malls will be shutdown and converted to space for some other useful purpose.